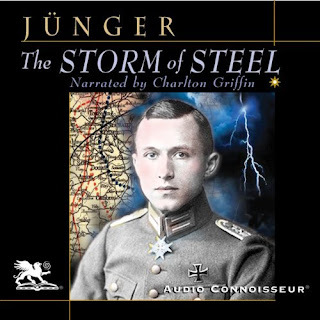 Ernst Jünger, The Storm of Steel, the 1929 translation, has been published as an audiobook in USA (2010) by Audio Connoisseur. It is narrated by the American reader Charlton Griffin. Listening length (unabridged): 9 hours and 46 min (69,5 + 64 MB). I bought it for ca 9 dollars. It is not sold to Europe, according to a notice on the audible web site, due to different copyrights, but I had no trouble buying it. It is not sold at the various co.uk sites, but at the .com sites. There is nothing to complain about the reading, on the contrary. However, beginnings and ends of the chapters are marked with silly sound effects (which should be war sounds) and sometimes melodramatic music. The 5 min sample of the audiobook is taken from the end of the Guillemont chapter, a couple of pages removed in the later editions, that is paragraphs not included in the 2003 translation. This classic war memoir, first published in 1920, is based on the author's extensive diaries describing hard combat experienced on the Western Front during World War I. It has been greatly admired by people as diverse as Bertolt Brecht and Andre Gide, and from every part of the political spectrum. Hypnotic, thrilling, and magnificent, The Storm of Steel is perhaps the most fascinating description of modern warfare ever written. Out of the maelstrom of World War I emerge scenes which could have come straight from Dante's Inferno. Once you begin listening, you cannot stop. And it never relents: nerve pounding bombardments, agonizing gas attacks, sudden death that takes down a comrade next to you, and the occasional weeks of relief to restore the spirit when leave is granted to visit some attractive French village... all enveloped in the ghostly confusion of war. Ultimately, survival comes down to sheer luck. Jünger displays no anger toward his enemies, and near the end he grows fatalistic and weary, even as he redoubles his resolve and maintains his patriotism. 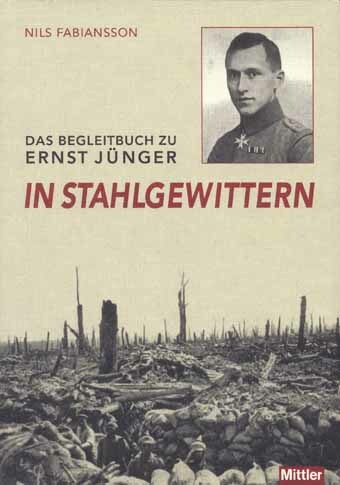 Jünger's great book calmly conveys the mysterious attraction of war, the exhilaration of battle, and the undeniable glory of brave men. But he also describes the scenes of soldiers preparing for battle as though they were "some terrible, silent ceremonial that portends human sacrifice".